BookHounds: HOPPY EASTER EGGSTRAVAGANZA Giveaway Hop #WIN 4 books! 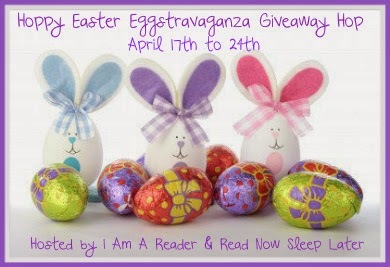 HOPPY EASTER EGGSTRAVAGANZA Giveaway Hop #WIN 4 books! There are a bunch of blogs participating in this one so be sure to stop by each one. Each has their own entry rules and geographic limits, so be sure to read the rules for each one. This hop starts April 17th and ends on April 24th, midnight. Now I read so many different authors. I do have one author that I have read all her books and never was disappointed is Mauve Binchy. It's sad that she passed away at 72 after an illness. Love her books. I love so many authors. Jane Austen for an easy answer. I don't have a favorite, I like many authors. As I said on your other blog I have so many favorite authors! I'll write down more of them here! Julie Wright, J.K. Rowling, Suzanne Collins, and Maggie Stiefvater. I have many favorites. I like Judith McNaught a lot, she has great books. Can't pick a clear favorite but love MM Kaye, Diana Gabaldon, Deanna Raybourn, Ken Follett. I really like Kelly Armstrong. My favorite author is Janet Evanovich. I don't really have a favorite author, though there are a few that I always get their books, like JR Ward, JD Robb, Christine Feehan, and Sherrilyn Kenyon. Oh man, that's a tough one! My tastes change so much throughout the year--you know how you get on various reading kicks! I guess if it's an all time, but don't necessarily re-read every year, I'd chose William Faulkner. Jane Austen and many,many,many, more!!!! Right now it's Anne Bishop -- LOVE everything she's written! I don't have a favorite. There's a few that I really like though. I like a lot of people. Dean Kootnz is one. My favorite is Janet Evanovich, thanks! Probably JD Robb (Nora Roberts), and Janet Evanovich and many more. Some of my favorite authors are: Richelle Mead, Melissa de la Cruz, P.C. Cast, Jeaniene Frost, James Patterson, Jennifer L. Armentrout, Yasmine Galenorn, Kim Harrison, Patricia Briggs and more. I know I left out some other good authors but lately my list of favorite authors has grown!! My very favorite author is Stephen King. I also love Joe Hill and Anne Bishop. My top 3 favorite authors are: Sherrilyn Kenyon, Christine Feehan, and Jennifer L. Armentrout. I have so many favorite authors but my top 3 would be: JK Rowling, Stephanie Meyer and Cassandra Clare.